The latest still photo from the slow motion, inter-party electoral horse race known as Iowa is in  and it looks like John Edwards is losing steam on the Democratic side while Mike Huckabee is charging at the G.O.P. front-runners. The University of Iowa Hawkeye Poll, released at 8 a.m. Monday morning, shows Hillary Clinton and Barack Obama in a heated battle on the Democratic side. Clinton leads the poll with 28.9% while Obama garnered 26.6%. 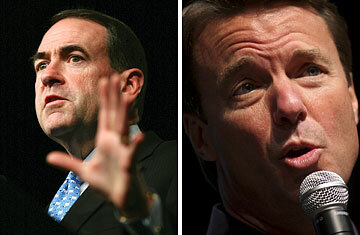 John Edwards trails with 20%, a 6-point drop from the last Hawkeye poll in August. For Edwards, who has basically been living in Iowa (and who parlayed a second-place finish there in 2004 into a spot on the Democratic ticket), the results have to be disconcerting. Unlike Obama and Clinton, he has few other strongholds, and a poor showing in Iowa could place his candidacy in serious jeopardy. On the bright side is that the people who do support Edwards have a history of showing up when it counts. Nearly 76% of Edwards' poll supporters attended the 2004 caucus, while 58% of Clinton's and 55% of Obama's supporters made the trip four years ago. "If we only look at caucus-goers who are almost certain to attend, we find that Edwards makes up the gap with Obama and Clinton, and moves clearly ahead," said David Redlawsk, the poll's director and an associate professor of political science at the University of Iowa. Of course, Bill Clinton skipped the caucuses in 1992, so this is the first time a Clinton is really running in the state, while Obama was an unknown almost everywhere four years ago. Another bad omen for Edwards: only 7.9% of Democrats polled said they are "very likely" to change their minds between now and January 3, when both parties caucus in Iowa. On the Republican side, the Hawkeye poll showed that former Massachusetts governor Mitt Romney has widened his overall lead by 8 percentage points, to 36.2%. But Mike Huckabee, a former governor of Arkansas, has gained ground despite spending just $1.7 million compared to Romney's $53.6 million. Huckabee is up from less than 2% in the same poll in August to 12.8%, putting him in a statistical tie for second place with Rudy Giuliani who garnered 13.1%. Giuliani had spent $30.2 million as of September 30, according to Federal Election Commission reports. "If Huckabee can motivate religious conservatives to attend the caucuses in large numbers, he may well threaten Romney and close some of the overall gap," said Redlawsk. About 44% of Iowa Republican caucus-goers consider themselves Evangelical or born again. The latest Hawkeye Poll comes less than a week after both parties set their caucus dates for January 3, the earliest presidential tests ever. The truncated schedule means that candidates will have to finalize their pitches before the holiday season. It also makes candidates vulnerable to any last-minute news events or surprises since they will not have time to respond after the holidays. And given how long the race has already gone on, many Iowans have begun to make up their minds: overall, less than 10 % remain undecided. This doesn't bode well for those outside the top tier. On the Democratic side, New Mexico Governor Bill Richardson's support declined from 9.4 % in August to 7.2%, while Delaware Senator Joe Biden was the only other candidate to break the 2% threshold. On the Republican side, Fred Thompson stands fourth with 11.4% followed by Arizona Senator John McCain with 6%. The poll of 285 likely Republican caucus goers and 306 likely Democratic caucus-goers was conducted October 17 to 24. It has a margin of error of plus or minus 5.8 percentage points on the Republican side and 5.5 percentage points on the Democratic side.